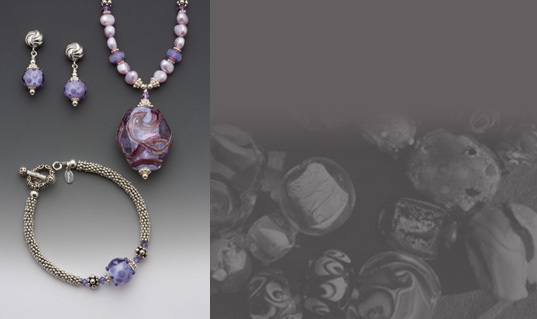 The sparkling shimmer of lilac dichroic glass provides the background for the abstract surface detail of this unique design. 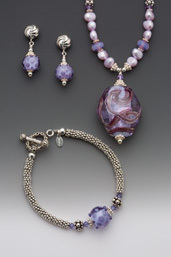 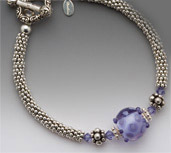 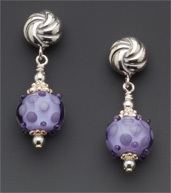 Twisted ribbons of deep purple and lilac wind delicately over the clear glass that surrounds the soft lilac background. 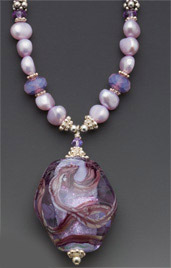 This hand sculpted glass pendant is featured on a necklace of freshwater pearls in shades of lilac, faceted glass beads, Swarovski crystals, and sterling silver beads.